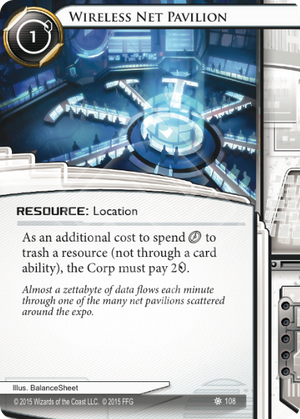 As an additional cost to spend click to trash a resource (not through a card ability), the Corp must pay 2credit. More broken than is immediately obvious. Let's you float tags and keep your resources in tact. Get 2 in play before you are tagged, and force the Corp to spend 2 , 10 to clear them. Combo with even a single Fall Guy and now it's 3 , 16 . Float tags like you really don't care, using Paparazzi to survive Scorched Earth. Then float more tags, because you really don't care: essentially ignoring the drawbacks of Account Siphon, John Masanori, Vamp, Code Siphon and Security Nexus. This card was featured in the 2015 Worlds winning deck. The package was exploiting Data Leak Reversal supported by Wireless Net Pavilion, Fall Guy and Paparazzi. With multiple copies of Wireless Net Pavilion out, it costs the Corp 8 resources to remove a single Fall Guy! In the meantime the Runner keeps tapping with Data Leak Reversal and uses Account Siphon when required to prevent the Corp being able to trash the whole set-up. The package was so good that FFG made the card unique in December 2015. This now means that the maximum cost to trash a resource is 4 credits. In turn, this increases the interaction of the game with the Runner needing to keep the Corp's credits much lower by forcing rezzes.